Amazon's Askville question and answer service went live yesterday. Users can earn experience points for participating and can also get Quest Coins, a form of virtual currency. There's an extremely detailed breakdown of how to earn Quest Coins here although you can't do anything with them yet. To ensure independence and integrity in the answering process, answers to questions can't be seen until after the process is closed. This should lead to better answers and reduce copycat answers. Amazon is also guaranteeing an answer to every legitimate question through its Mechanical Turk service. More features here. 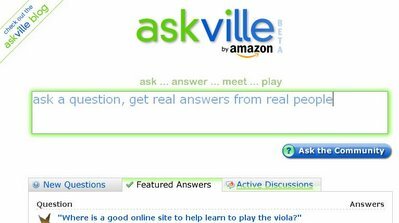 The big question is whether Askville will be able to successfully compete with Yahoo Answers given the recent closure of Google Answers.